Adoption FAQ: What Happens After an Adoption Takes Place? 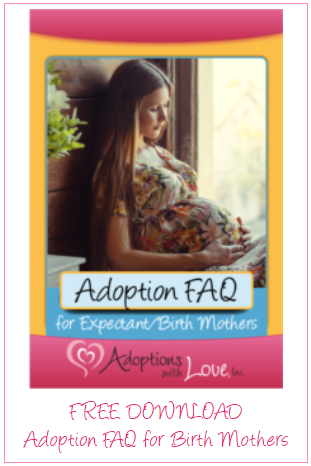 If you are an expectant/birth mother considering adoption, you likely have many questions regarding the adoption process. Not to mention, you may be working through many emotions in trying to make the best possible decision is for you and your unborn baby. Adoption is not an easy decision, and right now, you deserve all of the answers you can get. At Adoptions With Love, we believe an informed decision is the best decision. That is why we are here to provide you with the information you need to make a choice for your baby – not just about the adoption process, but also what happens after the fact. What happens after you place a baby for adoption? Is post-adoption support available to you? Expectant and birth mothers making an adoption plan deserve a whole lot of love and support – not only during their pregnancy, but after the adoption takes place, as well. When you work with a caring adoption agency, they will recognize this. If you make an adoption plan with Adoptions With Love, for example, you will be entitled to ongoing care and free counseling for a year after your baby’s birth and placement. We are always here for you, and encourage you to take advantage of this unending support. The support you receive directly from Adoptions With Love is ongoing. After an adoption takes place, you can expect to experience a range of complicated emotions – love, grief, wonder, regret, hope, relief. After pregnancy and delivery, the body needs time to recover and heal. So does the heart. Talking through any difficult feelings with your adoption counselor can help ease your transition back into life, and help your heart cope even years after the adoption takes place. In addition to the free counseling services offered, Adoptions With Love also maintains a letter and picture program between birth parents and adoptive families. This way, the birth mother can receive updates on her child over the years, after the adoption takes place. This is a nice way to stay in touch and up-to-date on what is happening in each family’s lives. Depending on the type of adoption plan you choose, you may also expect a more involved relationship with your child’s family after the adoption takes place. Many of our families opt for open adoption arrangements that involve direct contact between both families. This allows birth parents to stay in touch with their child over the years, and gives the child access to many answers about his or her adoption story. Open adoption can take on many different forms. It may include emails, phone calls, or even in-person visits. The open adoption plan is one that is determined by the birth mother and agreed upon with the adoptive family. Adoptions With Love will assist setting up an open adoption plan. The birth mother may determine how much or how little communication she wants, and the plan may evolve over the years. Open adoption has been proven very positive for children and for birth mothers, who often find peace of mind in ongoing updates, after the adoption is finalized. Adoptions With Love can also act as a liaison and help coordinate ongoing contact between birth and adoptive families, if needed. We are also here if you just want to say hi. Our staff loves to hear from birth and adoptive families over the years. We like to develop a relationship with each birth mother and adoptive family we help. You can think of Adoptions With Love as a part of your forever family. In addition to our compassionate counselors at Adoptions With Love, birth mothers find it helpful to have a supportive network of others who have walked in similar shoes. That is why Adoptions With Love hosts ongoing support groups and workshops for birth mothers who have chosen adoption. After your adoption is finalized, you can confide and share your experiences with other young women who have made adoption plans. You should never feel alone in this adoption journey. You should never feel alone after your adoption takes place. No matter your circumstance, or who you have in your support team, Adoptions With Love will always be here to help. We can guide you throughout your journey, from pregnancy to the adoption placement and beyond. To learn more about our ongoing adoption services, or to talk to a professional about what to expect after your child’s adoption, please do not hesitate to reach out. Call Amy, Nancy, Jess, Kelly, and Brittany at 800-722-7731 today. Or text us confidentially at 617-777-0072. You may also get more answers about adoption in our new eBook, “Adoption FAQ for Birth Mothers,” below. ← Adoption FAQ: How Much Does Adoption Cost for Birth Mothers?